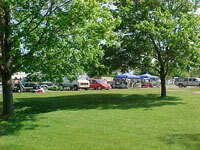 The park features a large (175' x 280') green area, planted islands, town clock, nautical flag pole, wine and cheese shop, kite shop, children's play structure, fountain and picnic pavilion. Public restrooms are available during the summer season in the DNR Harbor restroom facility. 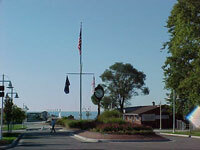 The East Tawas State Dock lies at the foot of Harbor Park.